One of my tricks for locating tattoos is to walk by the Borders on Penn Plaza and see if anyone's reading tattoo magazines. On Thursday, I spotted Sheldon in the store in the checkout line. He had two sleeves worth of ink, but I am trying to steer clear of big, wrap-around pieces, because I don't think I can give them a lot of justice in a blog format. There are exceptions of course (here and here, for example), but one generally needs a little more time to do it right. 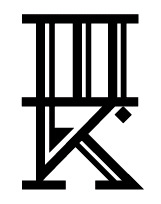 Anyway, I settled on the left inner forearm (above) that had two distinct pieces. The top piece was inked in Pensacola, Florida, when Sheldon was in with the Marines. It is a design of a Native American looking out off of a cliff. The one below it is a King of Spades, but will skulls instead of faces. A friend of his had the Jack of Hearts, so he went with the King of Spades. He credited this tattoo, along with all his other work (the Native American piece, excluded) to a custom artist in Japan named "Augie". Sheldon was stationed there with the 31st Marine Expeditionary Unit and had a lot of work done before being deployed to a different theater of operations. Most of his work on the right arm is traditional Japanese design. He started initially with the forearm and then went from the elbow up over the shoulder and onto his chest. He said is was a "yakuza design". Sheldon told me that Augie didn't have time to finish the left arm, due to his re-deployment, but that he hopes to return to Ginowan, Okinawa to finish up his sleeve. Thanks again to Sheldon for sharing his ink with us here at Tattoosday! I often find myself wanting to discuss ink, but don't always have the photos to accompany a post. Despite a slow start yesterday, I ended up photographing three subjects (as of this writing), the third was on the N train. I also provided reading material for two other tattooed people on the same train. 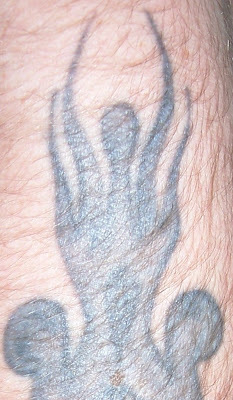 One guy had a forearm piece with Latin words traversing his hand and extending onto one finger. The other individual sat down net to me and had "To thine own self be true" inscribed on her right inner forearm. I was showing her the printout from this post, and she told me her inscription came from NYC Adorned. I'm hoping both of them (hint, hint) contact me so we can feature them here on Tattoosday! I spotted these tattoos on the plaza outside of Borders Books at Penn Station. He was in town visiting family and he certainly had a lot of tattoos to offer. "Thirty-nine," he answered, without hesitation when I asked him how many he had. His arms were fully-covered and he had others on his neck. We settled on these, because it seemed easiest, and Tattoosday has never presented fists before. All his work was done at Bayou II Tattoos in Picayune, Mississippi. He credited all his work to Chip, and said the art on his hands was custom-designed. Thanks to the guy from Florida for sharing his work with us here on Tattoosday. Last week, I posted the "after" version of a tattoo I spotted early last Fall. The host, John, e-mailed me the updated photos after I spotted him in at the grocery store. He also sent me shots of his three other pieces, posted above and below. 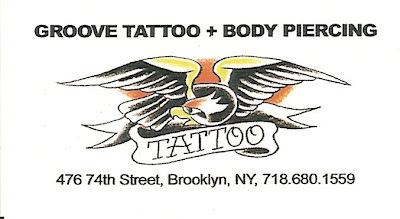 Via e-mail, John gave me the run-down on the tattoos, all inked at Body Art Studios in Bay Ridge, Brooklyn. "The tattoo with the knife through the heart is a memorial tattoo for my grandmother who passed away in 2000. I drew it and Peter [Cavorsi] tattooed it. It took me a few years to get it because I wanted to get the tattoo done on her birthday... October 13, but I wanted to wait for a Friday the 13th 'cause that was her lucky day." "As for 'Cheech,' it is another memorial tattoo for my Uncle Patty, my grandmother's brother. That is why it is in red, so it looks like the blood dripping from the knife [that] wrote out his name. He got the name 'Cheech' in World War II. It was his nickname, which is weird, because we are Italian and 'Cheech' in Italian is a nickname for Frank. Both of the tattoos are on my left forearm...". The black and gray piece is a Chinese character [kanji] with ... fire. The symbol means 'art as a skill' and the fire around it represents my passion for the art, as I am practicing to be a tattoo artist myself. It was...my first tattoo, inked by Peter in 2002/2003". "...Last is the one on my left calf, which in Chinese means "fear no evil". I got that in 2002-2003, as well. 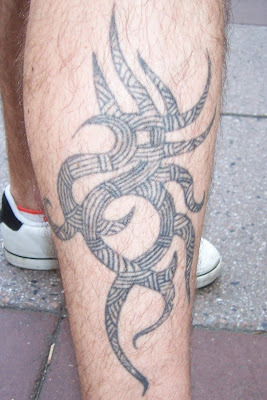 It was tattooed in Body Art, but was done by someone who worked for Peter at the time. I think his name was Sig or Zig...". On a side note, the guy who worked for Peter did my first tattoo, and he went by the name of "Sickie". I think we're talking about the same guy. Thanks again to John for coming through and sending me the photos and the back stories on his tattoos! Editor's note: John's comments are 99% verbatim. I took a little editorial liberty with some punctuation and spelling, along with an occasional edit, for the sake of clarity. Back in April, I posted an incredible back piece that was sent to me by a comrade in the blogosphere, Mat Giordano. Revisit it here. Totally worth it. Shortly after sending me the elephant pictures, he sent me these, to add to the mix. I thought it was time to be a good blogger and share. Full disclosure: these are in Houston, photographed and sent by someone I've never met, but have spoken to on line. 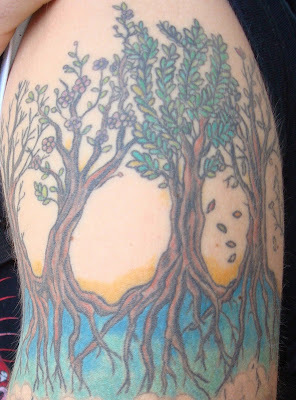 Nonetheless, it's amazing ink, and Mat is a multimedia designer, so his work is pretty interesting. I just didn't know it until I saw Travis' stencil. Me: did you do the design or was it a collaborative effort with Travis [the artist]? Mat: I say "I'd sort of like this"
and say "tattoo what you think belongs there". whose name you can see on my wrist at the end. Me: Absolutely, especially when they are so significant to a specific time and place. As you can see, interesting discussion about the emotional weight behind tattoos as symbols of not only the abstract (the idea of 'home'), but of concrete places as well. Later on, Mat elaborated : "I couldn't really understand, beyond the fact that Travis is a great friend of mine, why my mind immediately wanted those colors [in the hibiscus] he predetermined right before we started, until I realized the weight of what they meant in my subconscious, which fortunately made its way through a pretty muddy network to my conscious so I could relay it to the artist. Thankfully, Travis can read me pretty well, in turn cutting plenty of my mindless stares and utters out of the time frame." Mat has communicated about tattoos with me on a level more cereberally than anyone I have met since Tattoosday began. He's above and beyond the "I-liked-the-art-on-the-wall" mentality, which is fine for many people. Below is a shot of Travis Stanley, the artist at 713 Tattoo Parlour, in Houston, Texas, working on Mat's flower tattoo. Jack, as mentioned above, is his son. The name was inked by Marc da Sharc at I-Drive Tattoo in Orlando, Florida. Marc da Sharc also did the other piece, but at the aforementioned 713 Tattoo Parlour. 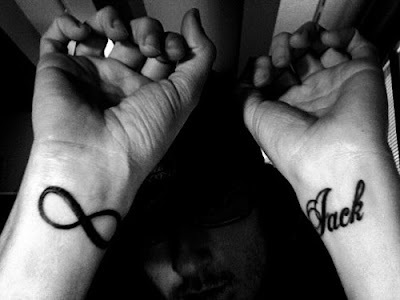 For those unfamiliar with the design, it is the symbol for infinity. Mat specifically wanted to clarify that the placement of that symbol on his wrist "by no means was a decision based on how long he thinks he'll be around". Thanks again to Mat for sharing his tattoos here! 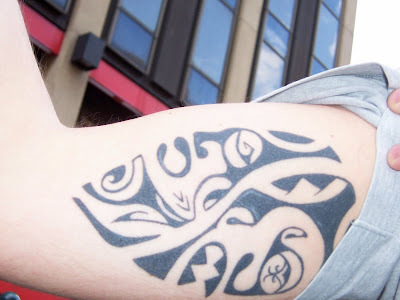 Ian Jones Has Thirteen Tattoos. Here Are Four. I saw this hannya mask outside of Penn Station and went up to talk to its host, Ian Jones, a Long Islander waiting for a train. Despite a light rainfall, we chatted for ten minutes or so about his tattoos and the stories behind them. Since the advent of Tattoosday, participants' reactions to the project range from total disinterestedness to moderate amusement. Ian, however, took it a notch higher, to the point of downright enthusiasm. He sounded sincere in his appreciation for the blog (and the idea behind it), and I got the impression that he would have let me take pictures of each tattoo, had time and weather permitted. 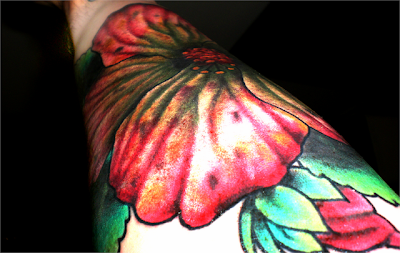 The big piece that first drew my attention was the colorful half-sleeve on his left bicep. The hanyya masks are traditional elements in Japanese tattooing styles, and he has two masks representing good and evil. This tattoo, about ten hours worth of work so far, was done by Kristen at Artful Ink Tattoo Studio, in Bohemia, on Long Island. 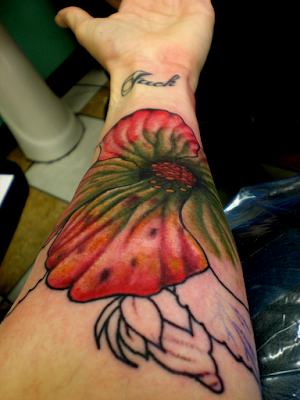 He noted that it was also a cover-up of a "bad sparrow and flower". Ian says he gets the most questions about his Volkswagen logo on the inside of his right wrist. He explains why he got an automotive emblem on such a prominent spot: he's always loved German engineering and has always had VW vehicles. His first car was a VW Eurovan, but his second car, a VW GTI 2-door hatchback, was what cemented his love of Volkswagens for life. Ian told me how he was in his GTI when he was in a horrible crash. The other vehicle was purportedly going 100 MPH and Ian is convinced that the VW's structural shell protected him from critical injuries. As a tribute to the GTI, and as an expression of his love of Volkswagen, he had the VW logo inked on his shifting arm (he now drives a VW Jetta) as a reminder of his survival from such a harrowing experience. There is Long Island on the forearm and a star on his inner wrist. The star was inked the same time as the VW logo to provide balance, but it grew to take on a more important meaning. It's a reminder symbol about a friend of his who is in the Marines. The VW and star were inked by his friend and bandmate Tony Coffins at Resonance Tattoo, also on Long Island (Center Moriches). Ian and Tony are in a band, Phoenix Rise, together. See their MySpace page here and listen to them play. The tattoo of Long Island, which Ian admits is not done that well (although I would say at least looks like Long Island), is nonetheless, still near and dear to his heart. Ian was adopted when he was a baby, and he feels that he could have ended up anywhere, and Long Island was his home. He is proud to be a Long Islander, and thus wears this as a badge of honor. Thanks to Ian for his enthusiasm for Tattoosday, and let's hope we see more of his ink here in the future! I wondered when, just buy the nature of my talking to so many tattooed people, I would approach someone about Tattoosday, having already featured them on the blog. The first piece is a classic koi tattoo, done on the front of the calf. There is a dragon on the back of the leg but it is not finished yet, as color still needs to be added. The host, John, is from the Bay Ridge area and had his koi inked at Body Art Studios on 3rd Avenue. We know the artist, Peter Cavorsi, who also runs the shop, because he is responsible for one of mine and three of my wife's pieces. I strongly recommend his shop if you live in southwest Brooklyn. His shop is clean and he does very nice work, as you can see from John's koi. Koi are a traditional part of Japanese tattoo, and are very common subjects n body art because they represent good fortune. Despite their being regular subjects, they seldom are ever one in the same. Like snowflakes, they tend to differ from body to body, and unlike tribal pieces, I don't think I could ever get bored of koi tattoos. John estimated that this large leg piece, including the dragon on the back of the leg, not pictured and not yet colored, took 13 hours so far. A lot of people don't realize how much time goes into elaborate pieces like these. On shows like Miami Ink, a ten-hour project can be compressed to five minutes of screen time. Well, last Sunday, I saw the finished work, not realizing that John had been here previously. I handed him a flier at the grocery store, and he reminded me who he was. He was busy with groceries, but he promised me he'd send photos of the finished work. He estimates that Peter had spent an additional nine hours on the piece since October, making it about 22 hours in total. That's one thing about the whole "_____ Ink" television experience, the work is edited down so much that many people don't realize how much effort goes into the large quality pieces. Thanks to John for sharing his finished leg piece with us! Stay tuned!! He also sent me photos of his other tattoos, which will be featured in a later post. I ran into Susan, walking south on 3rd Avenue last Saturday. She sports nine tattoos in all, but the one that jumps out at you is the piece above on her lower left calf. I have yet to master the art of photographing a wrap-around piece, so bear with this one (although I think I did ok). First the story behind the ink. Susan is a proud parent and, like most parents, her body art reflects her love of her child. She has been getting tattooed since her son was 3 (now he's 10) and he has even collaborated on designing some of her work. 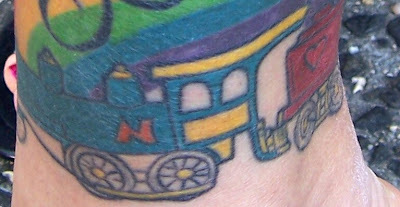 If memory serves, her son's name is Nicholas, which explains the "N" on the locomotive. He is a HUGE fan of trains, to the extent that he knows subway lines and is adept at giving directions and the MTA routes. Thus, the central element of the piece. complete with hearts and a Pac-Man symbol to reflect her son's love of video games. His love of rainbows, as well, is reflected by the multi-colored arc over the train. The piece is completed by the rising sun (a play on "son"). The end result is a vibrant, wonderful piece of body art which is poignant and visually-appealing. This tattoo, along with all her other work, was inked be Peter Cavorsi at Body Art Studios in Bay Ridge. 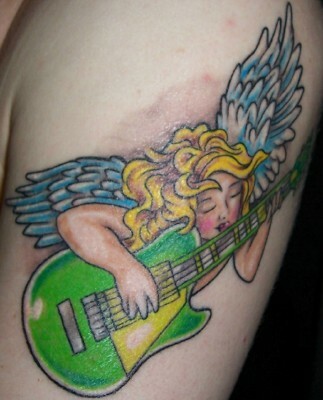 Peter inked my guitar-cherub (at the bottom of the page) and has appeared on Tattoosday many times before (click here to see the various pieces). 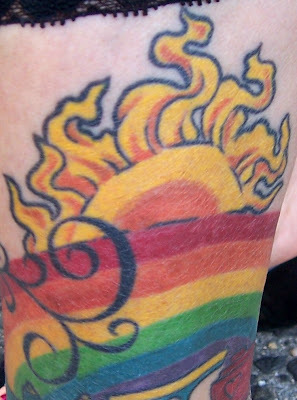 Thanks to Susan for bringing some colorful maternal ink to us here at Tattoosday! I initially just saw the bottom of this tattoo, an inverted cityscape poking out from under a sleeve. Quite unusual, so I had to stop Kyle and ask. We were on 7th Avenue, and I was using the borrowed Sony Cyber-shot of a co-worker (thanks, Tina!). Kyle rolled up his sleeve and blew me away. The detail and color of the tree were breath-taking. And if you click on the initial photo to enlarge it, the detail in the buildings is astonishing, with color on the billboards and light emanating from some of the tiny windows. The concept behind this piece, Kyle explained, is that the country is Heaven and the city is Hell, separated by a layer of purgatorial clouds. He was raised in upstate New York, far from the five boroughs of New York City and its eight million-plus inhabitants. This work was inked by Myles Karr at Saved Tattoo in the Williamsburg section of Brooklyn. Thanks to Kyle for sharing this piece with Tattoosday! Needless to say, I was amazed. Our paths intersected at 23rd and 7th around Noon. He had neck work and a sleeve, and an incredible lighthouse tattooed on the back of his left leg (for his fiancée, he later explained), but I didn't think I'd catch him. He was walking faster than me, and had earbuds in. I generally don't like to a) interrupt people listening to music and, b) chase them. But I happened to be walking the same direction and, when I noticed he had stopped to look into the windows of Dan's Chelsea Guitars, condition "b" was no longer a factor. I approached him, distracted him from his ear buds, and introduced myself. I forgave myself the interruption because his work was so well done. As I always do, when speaking with folks with multiple tattoos, I asked him which meant the most, which piece I could feature here on Tattoosday. 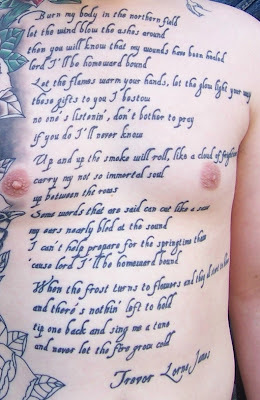 He acknowledged that he had a chest piece which was "in progress". Did he mind showing me on the street? As the photo above indicates, not at all. Excuse my manners. I didn't introduce our host properly. The guy on the sidewalk displaying has tattoos just downstairs from the Hotel Chelsea was Carson James. Carson is a Brooklynite that plays bass in a band called Tombs (click to hear some of their stuff on their MySpace page). And when he pulled his shirt off, I was expecting a great chest piece, but nothing like what scrolled across his body. Carson confirmed, the words were the complete lyrics to a song, "Burn My Body" by William Eliot Whitmore. "What," I asked, "is the significance of this song that made you want to preserve it forever on you like this?" He told me how, about two years ago, his younger brother, Trevor Lorne James, was killed in a motorcycle accident in New Jersey. His parents were understanably distraught over such a devastating event, and the decision fell to Carson - his brother's body was cremated. You can see a video of Whitmore performing the song here. We talked about cremation and I asked if he had ever heard the poem "Cremation" by Robinson Jeffers (read it here). I promised to e-mail it to him later. This piece, and most of Carson's work was inked by Thomas Hooper, an incredible tattooer who worked out of Frith Street Tattoo and Piercing in London, and now works out of New York Adorned's Brooklyn shop. You can see more of Hooper's amazing work on his web site here. The quality of Hooper's tattooing is truly awesome. Carson also gave me some more background on his other work (which I did not photograph). His right arm is sleeved with a depiction of Samuel Taylor Coleridge's "The Rime of the Ancient Mariner" and, as mentioned earlier, the lighthouse is for his fiancée. It should also be noted that this is another first for Tattoosday, as Carson is the host here whose face is visible in a tattoo shot. Understandable (and appreciated) due to the size of the featured work. Thanks so much to Carson for sharing his ink with us here at Tattoosday! Saturday night, I ran into Thomas, who was waiting for the B16 bus on 86th Street in Bay Ridge. Thomas is a manager at Galaxy Collectibles in Park Slope, Brooklyn. 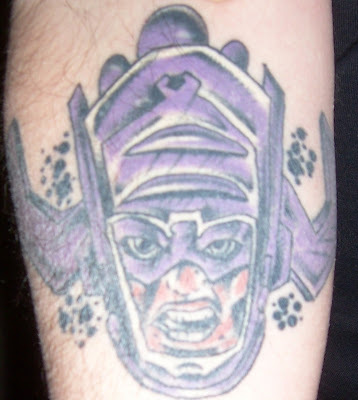 The store specializes in comics and related items and Thomas' tattoos reflect his love of the Art of Comic Books. 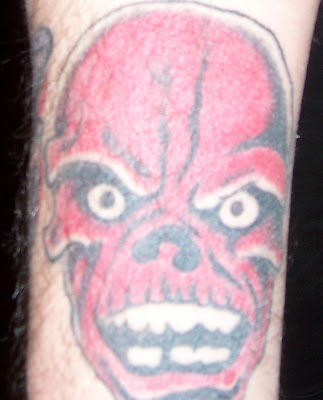 Above we have the inner forearm, his right, which he has dubbed "The Bad Guy Arm". 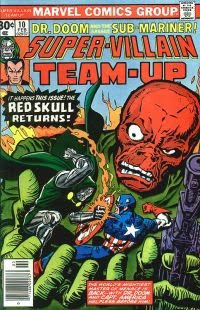 and below is Red Skull. As he was showing me the tattoos, he was explaining the characters, where they first appeared, and who designed them. Thomas explained that he didn't start out with the intention of having "themed" arms, but they just sort of "evolved". 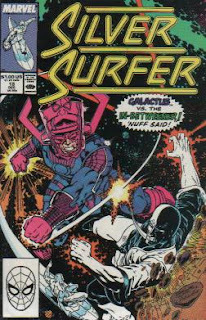 He started with Galactus, and then realized another piece just below it would make sense and fill the space neatly. These were all inked by his friend Marc Redbeard at Groove Tattoo in Bay Ridge. Work from Groove has appeared previously here. His next project is "The Good Guy Arm," his left, which already has a Superman logo and The Green Lantern. Thanks to Thomas for sharing his cool ink with us here on Tattoosday! A seriously long line at the Post Office cut into my outside time at lunch, which adversely affected my tattoo-spotting on Wednesday. However, I took advantage of the long line at the Philatelic Window and introduced myself to Barrett, who offered up the tattoo above. He has four tattoos, but this was the only one visible. 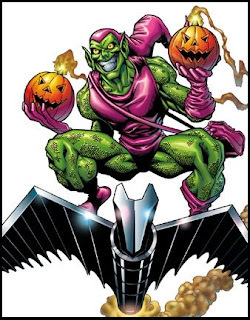 It was inked about 13 years ago in his home in Colorado by a free-lance artist named Bryan Saren. Mr. Saren is mentioned in several Durango, Colorado newspaper articles as a local artist and sculptor. I will assume its the same guy. 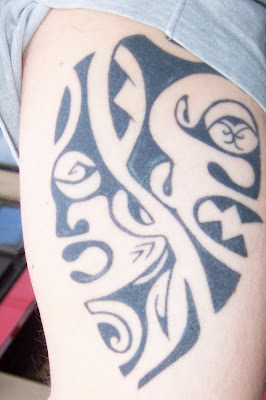 Barrett designed this piece himself and, although he acknowledges that it resembles the "tribal" category, he doesn't consider it a tribal tattoo. He was just playing with the design and liked the end result, which is comprised of a melding of a squid and an elephant. The squid is at the tail end, or top of the piece. And the elephant is at the front. A closer look shows the center axis is comprised of the elephantine trunk, surrounded by two shorter, curving tusks. No special significance to squid and elephant, just part of the design elements. Thanks to Barrett for sharing his work with us here at Tattoosday! Sure I'm posting Wednesday but both of these volunteers were MSG plaza-dwellers on Tuesday and, rather than save then for separate days, I thought I'd put them together. Sorry I cut this off, but I couldn't see the screen in the sun's glare. Erik has a 3/4 sleeve (left arm), his mother and grandmother's names inked on, a small back piece, a leg piece, and a diamond on his chest, but we went with this design, on his left forearm, because it is more recent. 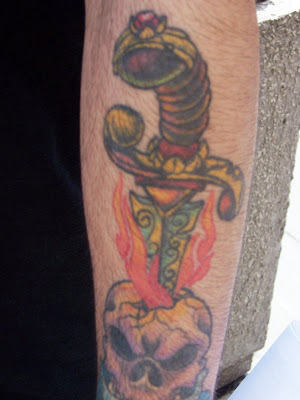 Tattooed by Eric Newman at Silk City Tattoo in Hawthorne, New Jersey (the shop was credited previously only two days ago here), this piece, a dagger through a flaming skull, was purchased for Erik by an ex-girlfriend, after she broke up with him. It is meant to represent a new beginning. There are two faces, one representing good, one representing bad, juxtaposed on the tattoo, which was inked on the island of Ibiza, which is part of Spain. Cesar told me the name of the shop was Sara, but I couldn't find a listing. However, considering the type of tattoo he received, I am going to go out on a limb and guess he got this piece at Tahiti Tiki Tattoo. Thanks to Erik and Cesar for making Tattoosday a true Tat-twos-day! I ran into Joe outside of Nino's Pizza in Bay Ridge, at 92nd and 3rd Avenue. His two forearm tattoos represent his belief in astrology. Both are relatively recent inkings. The dragon is about a year old. On his left arm, the piece was inked at Hypnotic Designs in Sunset Park, Brooklyn. He believes by Angel. Hypnotic Designs work has appeared on Tattoosday twice before, here and here (Angel credited there too). Joe was born in 1976, the Year of the Dragon in the Chinese Zodiac. The bull was inked at a shop in Ft. Lauderdale, Florida. Joe is a Taurus, astrologically, and the two pieces complement each other nicely. Joe is currently having a chest piece done at Kings County Tattoo Company. He couldn't show me the piece entirely, and it isn't colored yet, but he was absolutely raving about the quality of their work. Kings County tattoos have appeared previously on Tattoosday here. Thanks to Joe for chatting and sharing his astrological tattoos! On Wednesday, April 23, New York City simmered in pre-summer warmth and, while my camera was at the park with the wife and kids, I was stuck at work. Co-worker Cecelia (tattoo-less, as far as I know) was kind enough to lend me her Canon and, during lunch, I met a young woman named Grace who had the extremely interesting piece (above) on the back of her neck. 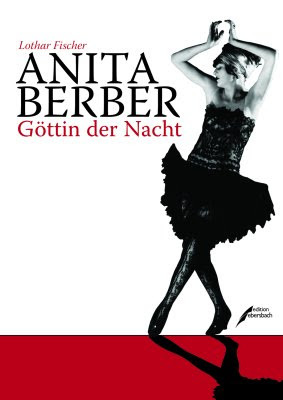 Grace explained: the woman is Anita Berber, who was, in her words, "a cabaret whore lady in the '20's". 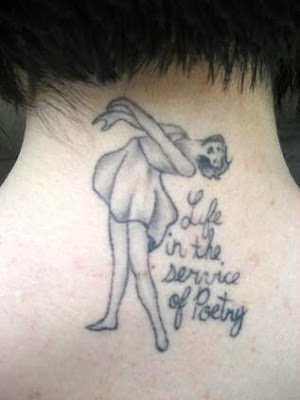 The quote, "life in the service of poetry" is an abbreviated version of the fuller quote "life in the service of poetry is a life not wasted". Grace attributed the quote to Berber, who came across it in an interview with Jack Terricloth, lead singer of the cabaret/punk band The World/Inferno Friendship Society. My research is unable to come up with the exact quote in the context of the interview, but that's beside the point. The sentiment is dead on. Grace, a student at Fashion Institute of Technology, explained further that the quote is not literally interpreted by her, but that she regards it more generally: "Living for whatever you think is beautiful," whether it be poetry, or some other form of artistic expression. This tattoo (one of Grace's two pieces) was inked by Nick Males at Silk City Tattoo in Hawthorne, New Jersey. Thanks to Grace for sharing Ms. Berber with Tattosday!